This morning, begin travelling along Main North Road through the Northern suburbs on our way to Burra in the mid North. Here we enjoy a welcome morning tea stop before continuing along the Barrier Highway to Peterborough and Yunta. After a stop for lunch we travel through the Barrier Ranges to Broken Hill arriving mid-afternoon. After a little time to relax we enjoy a three-course dinner this evening. This morning wake up to an outback sunrise, then after breakfast we depart on our outback journey which takes us along the country roads following the Darling River into the outback. We tour through Wilcannia which was once a busy paddle steamer river port. We continue to Trilby Station for lunch on the property. After lunch, we continue touring to Bourke. This morning after breakfast we enjoy a short tour of Bourke a surprisingly pretty township situated in the middle of the outback. Later we travel to Cunnamulla where we stop for lunch. Later our tour continues to Charleville arriving mid afternoon. The first Qantas Airmail Flight departed from the township in 1922. The many classic heritage buildings built here include the Queensland National Bank Building and the Corones Hotel which reflect the wealth and importance of the town in the early 20th Century. After breakfast today we travel north to Blackall the town is recognised as the site of the mythical “Black Stump”. The Jack Howe memorial in the town is a tribute to the man who set a world record by shearing 321 sheep in 8 hours with hand shears! We continue to Barcaldine. Barcaldine has gained its place in Australian history as the birth place of the Australian Labor Party. Labor had its beginnings here after the big shearers strike in 1891. The party was created under the “Tree of Knowledge” which still stands in the town. We continue to Longreach. This morning we begin a tour of this iconic outback township, which in the 1920’s was the original base for Qantas. We visit the original Qantas Airplane Hanger and interest packed Museum. The town’s tourist office is also a replica of the first Qantas Booking Office. Later, we visit one of Australia’s most famous and most visited attractions ‘The Stockman’s Hall of Fame’. The Hall of Fame provides an amazing insight into Australia’s history. Time will be allowed for you to enjoy an unhurried look at the special highlights and attractions on display here. This evening we’re off to join a wonderful sunset dinner cruise on a Billabong under the stars. This morning after breakfast we tour through Matilda Country! The area is famous for its artesian bores which receive their water from the Great Artesian Basin. Banjo Paterson is reputed as having written our iconic Waltzing Matilda here in 1895. In Winton, we visit the Age of the Dinosaurs exhibit to view an amazing collection of fossilized dinosaur bones from the prehistoric age. Later, travel along the Kennedy Highway crossing the famous Diamantina River through Middleton. We pass near a monument dedicated to the old Min Min Hotel. A lonely grave site at the rear of the hotel ruins is of a servant girl who worked there in its early days. After her death, the mysterious Min Min Lights are said to have appeared and many lonely drivers have claimed to have seen the lights hovering above the road nearby at night. Arrive in Boulia and check into your hotel before dinner tonight. After breakfast, we visit the interesting Min Min Encounter Centre and the amazing Stonehouse Museum. Enjoy the experience of spending time taking in the remote atmosphere at one of Australia’s most iconic bush towns before we continue to the little outback township of Bedourie for dinner tonight and our overnight stay. This morning we depart Bedourie. We pass the Diamantina crossing before arriving in Birdsville. Birdsville is possibly one of Australia’s best known and colourful towns. After checking into the Hotel for the night there will be an opportunity to enjoy a drink at the bar where you may meet a few of the locals. 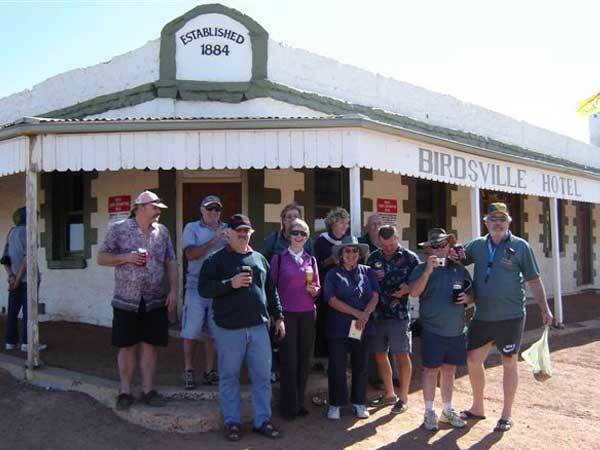 Tonight, dinner is a great Aussie experience at Australia’s most iconic hotel – the famous Birdsville Pub. Today after breakfast we begin our journey along the rugged Birdsville Track. We travel through the great Stony Desert and later into the Tirari Desert. At Mungerannie we stop for lunch. We continue along the Birdsville Track which travels on the outskirts of Lake Eyre before arriving in outback Marree for our overnight stay. This morning we enjoy a short tour of Marree. This old town was founded in 1840 and is the site of Australia’s first mosque. The mosque built by several Afghan Camel Drivers and was constructed of mud brick. Originally the town was called Herrgott Springs but due to the anti-German sentiment after the First World War was changed to Marree in 1918. We tour to Lyndhurst on the Strezlecki Track and call into Talc Alf’s unique Outback Sculpture Gallery. We continue to Blinman for a lunch stop and then through the amazing Flinders Ranges to Hawker and Peterborough. Today we begin our leisurely tour back to Adelaide. We drive through the Mid North grazing lands and pass through long abandoned little railway towns to beautiful Clare Valley. The area is famous throughout the world for the fine wines produced here. A special lunch awaits for you along the way. We enjoy a delicious winery lunch which includes fine wines from the area served to you at a historic local Wine Cellar Door Restaurant. After your special lunch, we continue our travels through Gawler back to Adelaide arriving approximately 5pm.